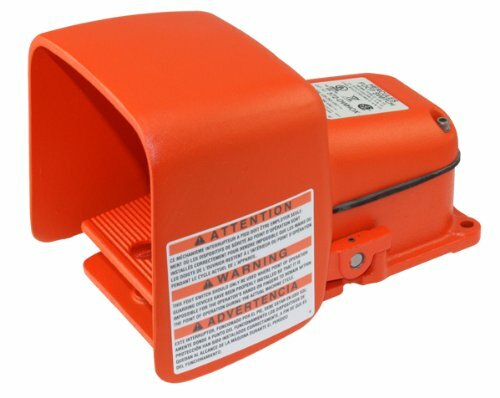 This Linemaster 532-SWHOX Hercules 20 amp 125-250V, 1 HP foot switch has a heavy pilot duty of 250V maximum. It has a cast iron housing, an extra oversized aluminum guard, and neoprene (polychloroprene) gasket and O-rings and is suitable for use in applications in which users need hands-free, on-and-off power activation. The foot switch provides single-stage, momentary action for quick-release termination. It has a cast iron treadle and housing for strength and durability, and the extra-oversized aluminum guard has 3/4" more opening height than Linemaster's oversized guard, for use with large-size safety shoes and metatarsal foot guards. The neoprene cover gasket and O-rings on the actuating shaft are corrosion resistant. The non-skid base prevents the foot switch from sliding on smooth floors and has bolt holes for mounting to the floor or equipment. It has a 3/4"-14 National Pipe Taper (NPT) threaded conduit entry for wiring. This foot switch meets Canadian and United States Underwriters Laboratories (UL) standards for quality assurance. It has an Ingress Protection (IP) rating of 56 for protection against contact with live parts and damaging deposits of dust and protection against heavy seas, and it is compliant with the Restriction of Hazardous Substances (RoHS) directive. This momentary operation foot switch is suitable for heavy-duty industrial and specialty medical applications, among others. Pilot duty Heavy, 250V max.